Happy Monday! Aimee here, with a layout using the “Practically Perfect” Kit. While everybody was watching the Super Bowl yesterday, I was getting my craft on. . . I created a layout all about me and it was so fun to create. 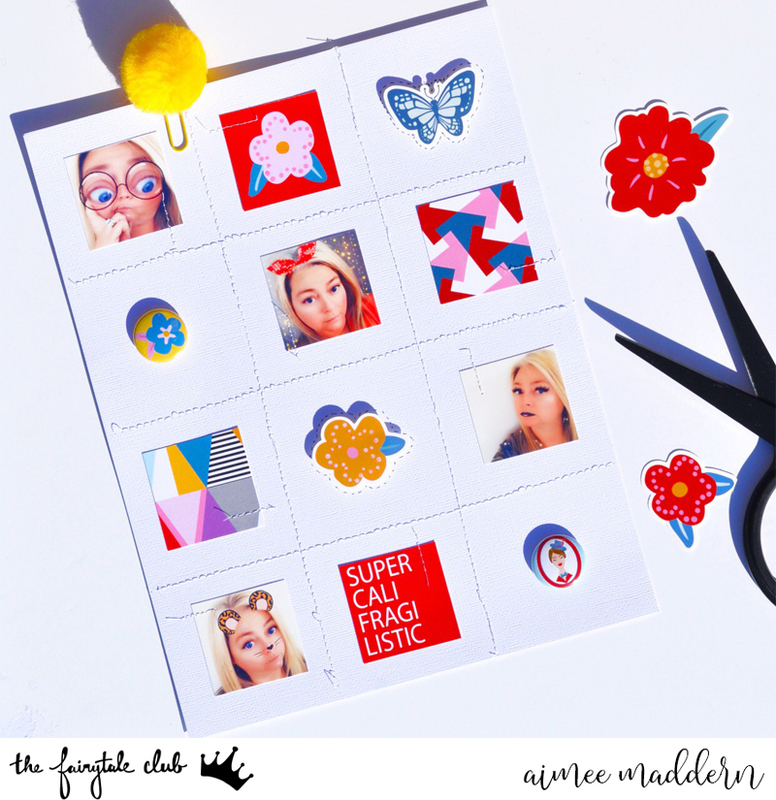 I love a grid layout, with a bunch of selfies! I started by printing a bunch of snapchat selfies at 1.75x1.75. Once the were printed and trimmed, I started moving pieces around on my paper. The grid that worked best for this 8.5x11 layout was 3 across and 4 down. Once I was happy with the layout, I snapped a quick photo of it with my phone, so I would remember where I liked everything. I then divided my paper up, made some pencil marks and then machine stitched my cardstock. I did the stitching before I adhered anything to the cardstock, this way none of the pop-up embellishments would snag on the presser foot. I really didn’t care if my lines were perfect so I just eyeballed the stitching. Next, I adhered everything to my cardstock. I used a tape runner for the squares, glue dots for the flair and 3-d adhesive foam for the die cuts. I really liked the way the layout looked at this point. I was afraid to add any more touches, in fear that it would overdo it, but I went for it. I faux stitched with a black pen around the die cuts. It ended up looking just fine and then I decided to machine stitch a little line on to every square, in different corners. Sometimes, its super fun to just scrap a page about yourself. Do you ever scrap those silly snapchat selfies? By the way who won the Super Bowl? I forgot to even look!